The aim of the thesis statement is to enlighten the technical and economic aspects of Eco-design and Eco-converted ships. The thesis starts with a well-rounded review of green shipping and sustainability while emission’s issue is a significant part of it. Following, the next part is devoted to regulations and methods towards eco-technology. At first, the Energy Efficiency Design Index (EEDI) is mentioned from technical and regulation point of view. Ballast water management is lengthy analyzed, while Energy Saving Devices are extensively examined. At that point, it was author’s decision to mention the LNG issue, which is of high significance for the shipping industry. Moreover, in order to get a balanced view, the study presents some Eco-design and Eco-converted ships. 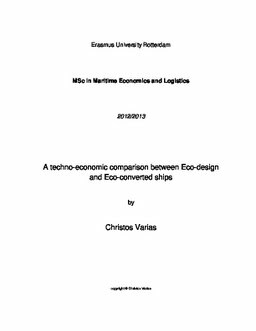 Furthermore, the study continues with the economic analysis, which presents the total cost differences between the existing and eco-design ships and the cost benefit analysis, which presents from the ship-owner’s point of view the economic differences between eco and eco-converted bulk carriers. Last but not least, there are written some conclusions of the thesis along with the recommendations for further research.